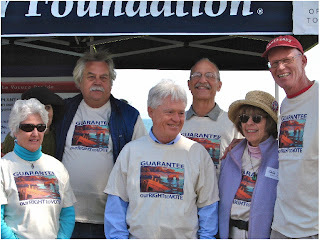 Pictured are five former Mayors of the City of Santa Cruz and one former County Supervisor (me). The Mayors are, from left to right, Jane Weed Pomerantz, Tim Fitzmaurice, Bruce Van Allen, Celia Scott, and Chris Krohn. We were all gathered on West Cliff Drive, in Santa Cruz, to support a citizen initiative that is aimed at guaranteeing the right of Santa Cruz voters to vote on a proposed desalination plant. Last Tuesday, July 24th, the Santa Cruz City Council certified the initiative petition, and set the matter for an election in November. Representative government is a pretty efficient way to allow designated persons to make decisions for us, and to act on behalf of an entire community. Make no mistake, though, when we elect representatives to act for us, we delegate to them the entirety of our political power. (1) The recall (to remove elected officials from office, if the voters decide they are not representing them well). (2) The referendum (to allow the voters at large to overturn specific actions undertaken by elected representatives, when the voters determine that this is not what they actually want). (3) The initiative (to allow the voters directly to enact laws that they believe are necessary and appropriate). In the case of the "Right To Vote On Desal" initiative, enactment of the initiative measure will place a new provision in the Santa Cruz City Charter, guaranteeing City voters the right to vote on any proposed desalination plant. Since such a facility would cost over $100 million dollars, and would have very significant environmental impacts, it does seem legitimate for the voters to decide that they want to "sign off" on a proposal that will have such a major impact on the future of the city (and on their pocketbooks). Recent past history provides a good argument why it would be prudent for City voters to enact a City Charter guarantee of their right to vote. In 2008, City voters enacted "Measure J," with 80% of the voters voting in favor. This initiative measure was intended to give City voters the right to vote on any proposed extension of City water services beyond the City's current water service area. The City was sued by the University of California at Santa Cruz, which is looking to City water to support the University's plans for very significant growth. You would think that the City Council would have stood up for Measure J, since it was enacted by an 80% vote in favor, but such was not the case. The City Council settled the UCSC lawsuit by discarding the guarantees found in Measure J. Since that time, the Council has done everything possible to help the University get a significant new share of City water (at the very time when the Council is demanding the construction of a desal plant, because there is a water crisis in the City). In view of this record, it's no wonder that thousands of City residents signed a petition to "guarantee their right to vote" on desal. I am planning to vote "yes" on the Right to Vote on Desal initiative. Whether a $100 million dollar plus desalination plant is a good idea or a bad idea remains to be seen, but as one City voter, I want to get my own shot at making the decision. Direct democracy does have its place. And as far as I am concerned, this is the place for some direct democracy!